You can make a simple mung soup with a few spices and serve it with vegetable sides or, as I do, you can cook the soup with vegetables to make it a heartier dish. My preferences are Swiss chard and winter squash or a combination ofchard, sweet potatoes, and zucchini. Also add any fresh herbs in the last 15 minutes. Steam any vegetables 10 to 15 minutes before finishing the soup—and, to add to the flavor, you can do this with salt, ginger, and (optional) garlic. If you prefer, you can add greens such as kale or chard, in the beginning. Other vegetables, particularly squash or sweet potatoes, tend to get too mushy if cooked all day. If you’re adding chopped onion, about 30 minutes before serving slowly brown the onion in ghee or oil until it caramelizes. (If you use shallots instead, they will brown in 10 minutes.) This additional step will infuse your final dish with a layer of flavor that you just won’t get by cooking onion in water or stock all day. 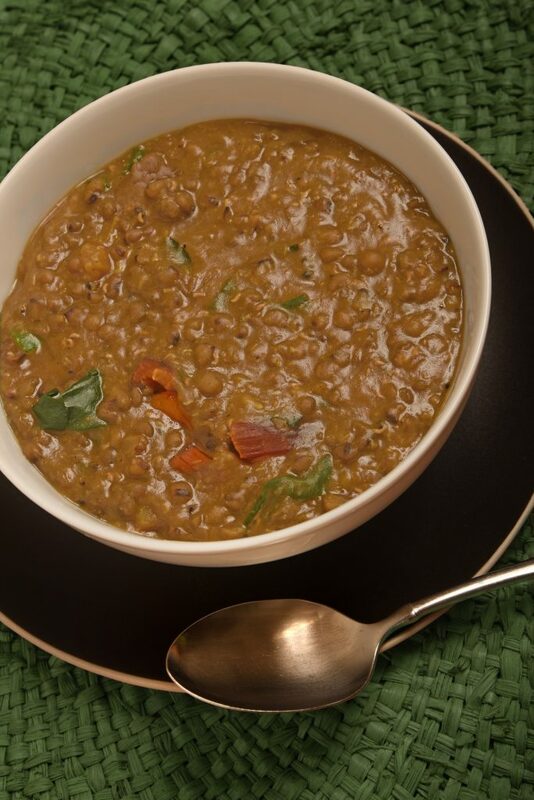 You can apply these tips when you cook this hearty mung soup recipe. If you prefer, and if you have the extra time at home needed to cook the beans in a regular soup pot, you can make this as a one-pot dish. I make this hearty soup once a week on an ongoing basis because it helps to keep the digestive system clear. When mung soup is served during panchakarma (Ayurvedic detoxification) programs, it’s very simple: cooked mung beans, salt, bay leaf and a few spices. When I’m cooking at home, I sometimes add onions for extra flavor and I often add vegetables for a more substantial dish. It’s a thick soup so it may suffice for your meal, or you can serve it over quinoa or rice. Sacred & Delicious: A Modern Ayurvedic Cookbook. You can find it at most independent book stores, or they will order it for you if you like supporting your local merchants. You can also find it at Amazon. Enjoy this Mung Soup recipe every time you need an easy meal…or an easy detox! Thanks to Vaidya Smita Naram for her recipe, which inspired mine. Cook’s Tip: Asafetida purchased at most Indian grocers is cut with wheat. Gluten-free asafetida is available at Savory Spice Shops and online. 1. Soak the beans for 6 to 8 hours. Strain and rinse the beans, and put them into a slow cooker with water and the bay leaf. Turn the cooker to the high setting. Start with 8 cups of water. If you are going to be at home, you can reduce the heat to low once you see the beans start to split, which will take 4 to 5 hours on high. If you are going to be away from the cooker for 6 hours or longer, start the soup on high for as long as possible — at least an hour, two hours even better — before turning it to low. When cooked on high, the soup can be ready in 4 to 6 hours (depending on altitude and climate). When cooked on low, it will take 8 hours or longer. 2. About 45 minutes before serving the soup, prepare the onion. (If you are omitting the onion, skip to #3 and 4). Chop the onion. In a medium sauté pan, heat oil on medium heat. When the oil is hot, add the mustard seeds and cover until the seeds pop like popcorn. Reduce heat to low or remove the pot from the heat source. Add asafetida (if using) and the chopped onion. Once the onion has turned uniformly golden (about 10 minutes), reduce the heat to medium-low and continue cooking another 20 minutes or so. When the onion is brown and caramelized, add the ground spices and stir for a few seconds. Then add the onion mixture into the pot of beans. Ideally, let the spices flavor the soup for at least 5 minutes before serving. 3. Chop some of your favorite greens and a zucchini. In the fall, add some cubed winter squash. If you’re eating the dish as part of your regular diet, you can swap out the winter squash for a sweet potato. (Sweet potatoes are considered too heavy for a detox diet.) Steam the chopped vegetables in batches, one batch for each vegetable, and then add them by batches to the pot. Steam the potatoes for 10 minutes. Steam the greens and zucchini for 6 to 8 minutes until tender (longer for kale). 4. If you are not using an onion, heat the ghee or oil in a small spouted pot, if possible. When the oil is hot, add the mustard seeds and cover until the seeds pop like popcorn. Reduce heat to low or remove the pot from the heat source. Add the asafetida and the ground spices to the ghee, and stir for a few seconds. Then pour the mixture into the pot of beans. Ideally, let the spices flavor the soup for at least 5 minutes before serving. 5. Finish the soup by adding ginger, garlic and salt to taste. Stir well. Serve each bowl with a small handful of cilantro, if you wish, and a splash of lime. Omit garlic and double the amount of ginger. Enjoy a dash of cayenne pepper.